All metals contain a movable substance called "electric charge". Even uncharged wires are full of charge! After all, the atoms of the metal are made half of positively-charged protons, and half of negative electrons. Metals are special because their electrons don't stay connected to the metal atoms, instead they constantly fly around inside the metal and form a type of electric "liquid" inside the wires. All wires are full of electric fluid. Modern scientists call this liquid by the name "electron sea" or "electron gas," or the "sea of charge." The fluid charge is movable, and this lets metals be electric conductors. The movable charge-stuff is not invisible, it actually gives metals their silvery shine. The electron gas is like a silvery fluid. Sort of. Whenever a circle of wire surrounds a magnetic field, and if the magnetic field then changes, a circular "pressure" called Voltage appears. The faster the magnetic field changes, the larger the voltage becomes. This circular voltage trys to force the movable charges inside the wire to rotate around the circle. In other words, moving magnets cause changing magnetic fields which try to create electric currents in closed circles of wire. A moving magnet causes a pumping action. If the circuit is not complete, if there is a break, then the pumping force will cause no charge flow. Instead, a voltage difference will appear at the ends of the wir es. But if the circuit is "complete" or "closed", then the magnet's pumping action can force the electrons of the coil to begin flowing. A moving magnet can create an electric current in a closed circuit. The effect is called Electromagnetic Induction. This is a basic law of physics, and it is used by all coil/magnet electric generators. Generators don't have just one circle of wire. Suppose that many metal circles surround the moving magnet. Suppose that all the circles are connected in series to form a coil. The small voltage from each circle will add together to give much larger voltage. A coil with 100 turns will have a hundred times more voltage than a one-turn coil. Why is this generator AC and not DC? When the magnets flip, they create a pulse of voltage. But when they flip a second time, they create an opposite pulse? Yes. So then a spinning magnet is always making electric signals that go plus-minus-plus-minus? Yep. It happens because, in order to create voltage and current, a magnet pole must sweep sideways across a wire. If instead it sweeps along a wire, nothing happens. In our little generator here, the magnet poles don't sweep constantly along the curve of the wire. Instead, first the north magnet pole sweeps across one side of the coil, and at the same time the south magnet pole sweeps backwards across the other side. The two effects add together. But next, the magnet keeps turning around, and now the opposite poles sweep across those parts of the coil. The magnet has flipped, the magnet poles are reversed, so the coil's second pulse of voltage will be backwards. And if a bulb is connected, then any current will be backwards too. Each time the magnet makes one complete turn, it creates a forward pulse and then a backwards pulse. Spin the magnet fast, and it makes an alternating wave: AC. If you want a DC generator, you'll have to add a special reversing switch to the magnet shaft. It's a switch called a "commutator." All DC generators have these. After every half-turn, it reverses the connection to the coil. That way it comes out as pulsed DC. If you look up some DIY projects for DC generators, you'll see how to build the commutator switch. But those generators aren't Ultra Simple! Now for the light bulb. If we connect the ends of the coil together, then whenever the magnet moves, the metal's charges will move and a large electric current will appear in the coil. The coil gets slightly warm. What if we instead connect a light bulb between the ends of the coil? A light bulb is really just a piece of thin wire. The charges of the light bulb's filament will be pushed along. When the charges within the copper wire pass into the thin light bulb filament, their speed greatly increases. When the charges leave the filament and move back into the larger copper wire, they slow down again. Inside the narrow filament, the fast-moving charges heat the metal by a sort of electrical "friction". The metal filament gets so hot that it glows. The moving charges also heat the wires of the generator a bit, but since the generator wires are so much thicker, and since the bulb's thin filament is slowing the current throughout the entire coil, almost all of the heating takes place in the light bulb filament. So, just connect a light bulb to a coil of wire, place a short powerful magnet in the coil, then flip the magnet fast. The faster you spin the magnet, the higher the voltage pump-force becomes, and the brighter the light bulb lights up. The more powerful your magnet, the higher the voltage and the brighter the bulb. And the more circles of wire in your coil, the higher the voltage and the brighter the bulb. In theory you should be able to light up a normal 3V flashlight bulb, but only if you can spin your magnets inhumanly fast. When you crank the generator and make the lightbulb turn on, you are working against electrical friction in order to create the heat and light. You can FEEL the work you perform, because whenever you connect the bulb, it suddenly gets harder to crank the generator. When you disconnect the bulb, it gets easier. Think of it like this. If you rub your hands together lightly, the skin stays cool, but if you rub your hands together hard, your skin gets hot. It takes more effort to rub skin hard so that it heats up; it takes work. And in a similar way, it's hard to heat the lightbulb filament, it takes work. You twist the generator shaft, the generator pushes the wire's charge through the tiny filament, and if you don't keep spinning the magnet, the magnet will be slowed quickly. When your hand spins the magnets, you can feel the extra work it takes to light the bulb. Try spinning the magnets with the bulb disconnected. The magnets become much harder to spin. This happens because your hand is connected to the flowing charge in the bulb, and when you push on it, you can feel it push back on you! How is your hand connected to the flowing charges? Your hand twists the nail, the nail spins the magnet, the magnet pushes the invisible magnetic fields, the fields push the movable charges, the charges flow slowly through the light bulb filament, and the tiny filament causes friction against the flow of charge and heats up. But then the reverse happens! The charge can't move much because of the tiny filament, so it resists the pressure from the magnetic fields, which in turn resist the pressure from the magnet, which resists the twisting pressure from the nail, which resists the twisting pressure from your fingers. So, in a very real way, you can FEEL the electrons in the light bulb filament. When you push them, you can FEEL their reluctance to move through the narrow filament! Try changing the magnets' position. Remove the magnets, then tape them around the nail so that the two stacks are clinging side by side, rather than stacked up in a line. Spin the magnets. Does the light bulb still light up? No. This happens because The N pole of one magnet stack is very close to the S pole of the other, and vice versa. The magnetic field is now stretching between the two stacks of magnets, and isn't spreading outward. Most of the field is trapped between the neighboring opposite poles, so the field doesn't extend out through the coil. When magnets are side by side like this, they form one larger but weak magnet. On the other hand, when you make a single stack of magnets instead, the field extends outwards for many inches. The stacked magnets form a larger but very strong magnet. If you spin the single magnet stack, the field cuts through the wires and pumps their electrons into motion. If you can get a Digital Voltmeter or DVM, you can make some measurements. (Once you can see some numbers, you can perform some professional science experiments. This is great for science fair projects.) Spin the magnets to light up the bulb, then connect the meter leads across the light bulb connections. Set the meter for AC volts. Spin the magnets and see just how high a voltage your generator produces. How high can you make the voltage just by using fingers? Or using a hand drill? Try spinning the magnets just fast enough to barely light the bulb in a dark room. How small a voltage is needed? Also try disconnecting the light bulb, then measure the AC voltage across the two ends of the coil. Can you tell if it's still the same as when the bulb was connected? Hint: to spin the magnets at a constant rate, use an electric drill with a fully-charged battery. Or perhaps hook the nail to an electric motor and connect the motor to a DC power supply with settable voltage. Note: The light bulb has around 50 ohms resistance. Also, 250ft of #30 wire has around 21 Ohms resistance. Because of the wire resistance, the generator can only create around 60 milliamps current at most (0.06 amperes.) If you wind extra #30 wire onto the generator, it will increase the maximum voltage, and maximum power. But since this adds more resistance it WON'T increase the maximum possible current. To increase the maximum possible current, either replace the #30 wire with thicker wire, spin the magnets faster, or use a stronger type of magnet material. There is a simple way to convert your generator into a motor. It involves using paint or tape to insulate a spot on one side of the nail, then using a 6V battery and using the generator's wires, touching the nail to form a switch. The rotating magnets turn the nail, which turns the coil on and off at just the right times. Can you discover the trick? The hard way: add a spinning "commutator" switch and sliding metal "brushes," so that each time the magnets turn half way, the switch reverses the generator connections. While running the tech shop at the Museum of Science in Boston, I was working on new ideas for exhibits for the Electricity Hall in 1988. I knew that the Exploratorium had an electric generator exhibit where the museum visitor would yank a plastic-embedded coil-plate through a row of huge magnets (large magnetron horn-magnets from WWII military radar.) Doing this would light up a small bulb. I just knew that there had to be some method which uses less expensive, common magnets. So I stacked up a pile of 3" loudspeaker magnets (those black donut things) and waved it past various coils. Finally I wound about five pounds of #26 wire around a ring of nails pounded into a board, hooked up a #49 light bulb, then moved the stack of speaker magnets in and out. This easily lit up the bulb. Around 1994 I was thinking about the ultra-simple electric motor which later became known on internet as the "Beakman Motor." Wouldn't it be cool if kids could also make an electric generator just as simple? But it needs be done using parts from a Radio Shack store, since Radio Shack had the special light bulb as well as magnets and spools of electromagnet wire. After a few hours of experimenting I fould that I could just barely light up the 20 milliamps bulb by using a single spool of #30 wire from radio shack. But the wire had to be VERY close to a fast spinning magnet, and the magnet had to be composed of four powerful ceramic magnets in a stack. To impress all the Physics Teachers, I tried to make the parts be easily available, and the cost as low as possible. To make a popular project, I made sure no tools were needed except scissors. I refused to use ball bearings or saw-cut plastic parts. So I made my own cardboard box for the coil, and used a nail for the spinning shaft. To avoid extra parts, the nail is just clamped by the powerful magnets. Here's a challenge: try to light a bulb, but do it with a generator which is even simpler. Want a much more powerful motor or generator? Those need stamped-out iron sheets for laminations. But there's another way. Look into Edison's tactic: he took the 1873 Gramme-ring Motor, modified it by adding a separate low-speed commutator, and sold them like hotcakes. The magnetic core, the 'laminations' of a Gramme rotor can be made from a long length of iron wire wrapped as a hoop and doused with epoxy, tar, etc. I don't know if fine iron wire is easy to find, but barbed wire and hay baling wire is common. Wrap heavy copper wire around the entire iron ring and mount it on a flywheel. Grind the outer rim flat, so the copper spiral can become its own commutator. The stator can be permanent magnets, or non-laminated solid iron blocks, since it's DC. Early versions used "paintbrushes" made of fine iron wire as the brushes, later replaced with blocks of slippery graphite. But then go and do as Tesla did, and convert your initial stator designs into a compact cylinder shape with enclosed coils, rather than using huge long horseshoe-magnets like Edison's "long legged mary anne" design. 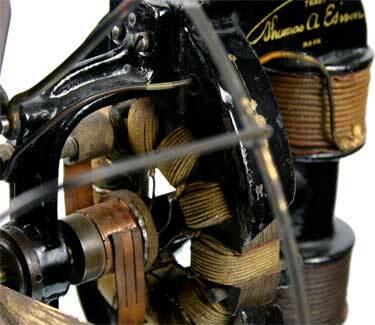 Motor Triva: electric motors were mere lab curiosities until Zenobe Gramme developed a generator which was intended to replace battery banks, since it gave extremely smooth DC output voltage. During an inventors show, an assistant accidentally connected an unused Gramme Dynamo up to another that was running under steam power. The second one ran as a motor, as a *hundreds horsepower* motor. That moment was the start of the electrical age in industry. But this breakthrough is not much mentioned in American Textbooks, perhaps because it would make Thomas Edison appear less of a genius. WARNING: Keep the magnets away from computers, disks, videotapes, color TV sets, and wallets and purses containing credit cards. Try this: Keep the generator far from your color TV, turn on the TV, start spinning the nail so the magnet is spinning fast, then bring the generator about 2ft away from the TV screen. DON'T BRING IT CLOSER!!! Keep spinning the magnets, and you'll see a cool wobbling effect in the TV picture, along with some color changes. The field from the magnet is bending the electron beam that paints the picture on the screen. Be careful, if you bring the magnet about 15cm away, the iron sheet inside the TV picture tube will become magnetized and the distorted colors will be permanent. Created and maintained by Bill Beaty.